So, in last post we talked about Paint.NET and how to get Photoshop brushes into it. Now, it’s only fair that we say a word or two about GIMP. Just like Paint.NET, GIMP is also free Image Manipulation Program. It was interesting to notice how Paint.NET had only 1.6Mb. That’s, like, really really small. GIMP seems to be a bit heavier – 17Mb. So, let’s see what’s GIMP‘s functionality when it comes to brushes and how could we use existing Photoshop brushes in GIMP. And Voila! 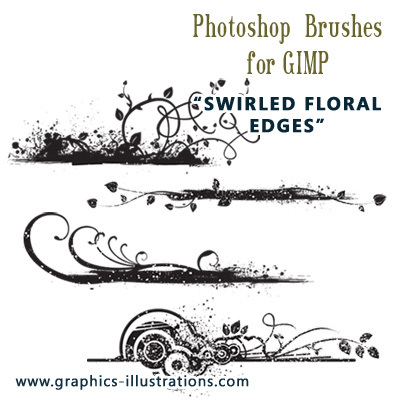 You now have Photoshop brushes in GIMP! Of course, to make the ultimate save for the ultimate brushes make sure to click on the banner on the right hand side (by the way, that’s my friend Mirta pointing with her finger :)) and see how you can get all of my ultimate edition brushes for 1/2 the price AND get ADDITIONAL $10 bonus (this $10 bonus is time limited offer so if you’re interested, now is the best time to buy)! Anyways, that’s all for now, I hope you learned something new and I’m looking forward to see your works, so please, keep’ em coming! I’ll feature them on this blog. How do you import .png into GIMP?